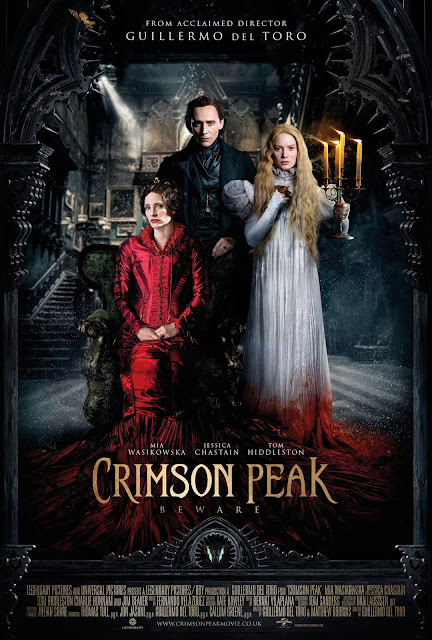 The trailer left me cold for Crimson Peak but I had heard a lot of people saying good things about it, even my father had heard of the film. It is a Gothic horror directed by Guillermo del Toro (Pan's Labyrinth) and is a pretty solid horror excelling for the most part at the genre chosen. Mia Wasikowska stars as Edith Cushing; the only daughter of a rich American businessman. After Thomas Sharpe (Tom Hiddleston) an English Baron meets Edith after a meeting with her father the two start a relationship of sorts, Edith has little knowledge that Sharpe is after her for her fathers money. After he turns up murdered Sharpe is there as a shoulder to cry on and not much later they are married and living at Sharpes dilapidated Allderdale Hall in England. 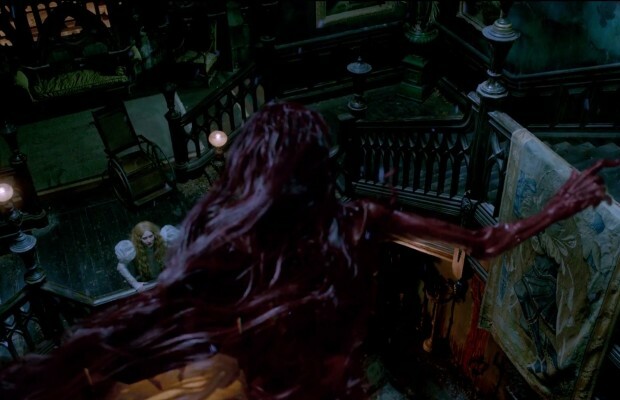 However Edith starts to be visited by ghosts and slowly she starts to unravel the dark secret of Crimson Peak (the nickname locals give the house due to the blood red clay it stands on). Sharpe and his sister Lucille are certainly not as innocent as at first appears. I loved this film, being a del Toro film this shouldn't come as a surprise as he is a genius at directing. Set in the early 20th century (I believe) this encapsulates the Gothic genre well. This has all the classic trappings; a creepy mansion, a mysterious man with dark secrets and hidden terrors. At it's heart it tries to be a love story, Hiddleson is fantastic as Thomas Sharpe, probably my favourite actor in a film that is full of great acting, aside from a few of the characters from the American segment of the film there was not a bad performance at all. It is made overtly clear that he and his sister are up to no good, yet his gradual softening towards his new wife is believable and gives the film its romantic edge. This is cold, sometimes emotionless old fashioned romance yet feels true to the genre. While many story beats are quite predictable there were still some surprises to be had, plus by sticking so closely to the Gothic genre it isn't a big shock when things take a turn for the sinister. I enjoyed the story and the film never tries to hide the fact that something bad is going to happen. Crimson Peak certainly is not a scary film, it tries and fails on several occasions to make jump scares (failed for me, a man a few seats down on my row nearly jumped out the roof at one point), yet despite this it is most certainly a horror. The horror comes from the location and characters rather than the ghosts that are abound. Allerdale Hall that Edith moves to is such a well designed set, very iconic, from the blood red ground outside to the ruined interior that has snow and leaves falling constantly through the roofless entryway, has giant moths all over the walls, and clanking machinery and wind blowing through it's hallways. 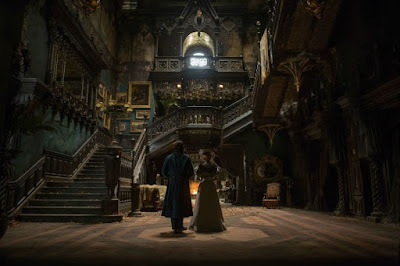 It simply looks stunning and fantastical, and this applies to all the locations and set designs, so much so that I want to get this on blu-ray purely for the aesthetic beauty on display here. The worst part of this film is the ghosts who unfortunately look utterly terrible. I believe the method used was for real actors playing them, who are then coated in CGI in post production. The CGI looks terrible, smoke wisping off of the gore stained creatures, none of which look anything other than very fake. In all honesty these ghosts could totally be written out of the plot without losing much at all, mostly the only purpose they serve is to help Edith find out the truth about her situation by literally pointing her in the right direction. There is only one occasion where a ghost actually does something that a human wouldn't have been able to. I do think it would be a better film without these creatures in it. When the physical violence and terror comes it comes in realistic fashion, the gore effects look fantastic and made me feel slightly queasy at times. I simply cannot go into what happens at all, needless to say there are a few deaths and all are suitably blood soaked and gory, the blood looking very visceral. The mansion built on red clay also gives the impression of having a river of blood beneath it, suitable for all the horror that has gone on there. This is not a scary movie, but this is a solid horror with some exceptional performances from the core cast and a pretty decent score too. Aside from the CGI on the ghosts this does little wrong visually being a feast for the eyes. One of the better horrors of the year and one I hope does as well as it deserves to.